When a child finds math challenging, it is useful to identify the underlying reason. Recent trends of classrooms shying away from drills in elementary grades and focusing on understanding arithmetic problems assume that a child already has the capacity to exercise a higher level of thinking. A child's brain, however, is still very busy forming and refining connections at this point. For children with disabilities, the development of various functions of the brain seems to lag behind. A thoughtful consideration of how a child's brain develops and works may be helpful in figuring ways to help a child who is struggling in mathematics. In both tests, the limit or capacity of one's working memory (the maximum number of flashing boxes (span-board) or number of digits (digit span) correctly recalled) is measured. Children with attention deficit disorder (ADD), for instance, often exhibit low WM capacity. A low WM capacity can seriously impair a child's learning especially when this condition is not addressed first. Math word problems are introduced in the early years of elementary schooling in an effort to make children see math in a much more tangible manner. Solving word problems can be challenging since these problems not only require arithmetic but also a translation of text to mathematical equations. Thus, strategies have been introduced to help children address word problems. For instance, there is cognitive strategy training. 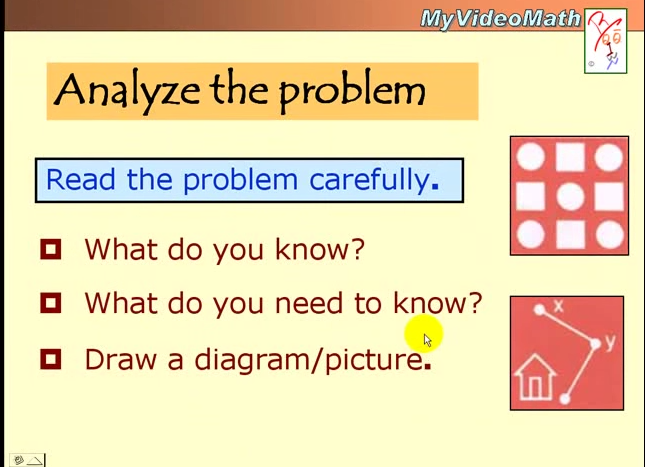 Here is an example from My VideoMath. The above likewise shows a visual strategy. Near the bottom right hand corner is a light blue ellipse with two smaller ellipses inside. 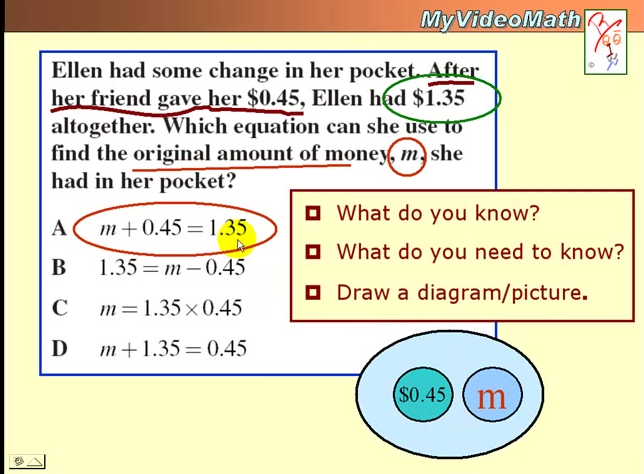 The large ellipse represents the amount of money Ellen had altogether ($1.35) and the small ellipse ($0.45) represents the money her friend gave. The unknown m is the amount of money Ellen had originally. The figure therefore represents the equation (m + 0.45 = 1.35) and m can now be determined arithmetically. The treatment consisted of performing WM tasks implemented in a computer program developed for this study (RoboMemo, Cogmed Cognitive Medical Systems AB, Stockholm, Sweden). The program was provided on a CD and used by the child on a personal computer either at home or in school. The program included visuospatial WM tasks (remembering the position of objects in a 4 by 4 grid as well as verbal tasks (remembering phonemes, letters, or digits) (see Olesen et al., 2004) for further description of the visuospatial tasks). Responses were made by clicking on displays with the computer mouse. The children performed 90 WM trials on each day of training. Total time depended on the level and time between trials. Medium total training time (excluding breaks) was about 40 minutes. The difficulty level was automatically adjusted, on a trial by-trial basis, to match the WM span of the child on each task. The teachers I had forty years ago probably did not know much about working memory capacity but they did drill me to stretch my working memory, and it probably helped.